LITCHFIELD — What a difference a year makes. 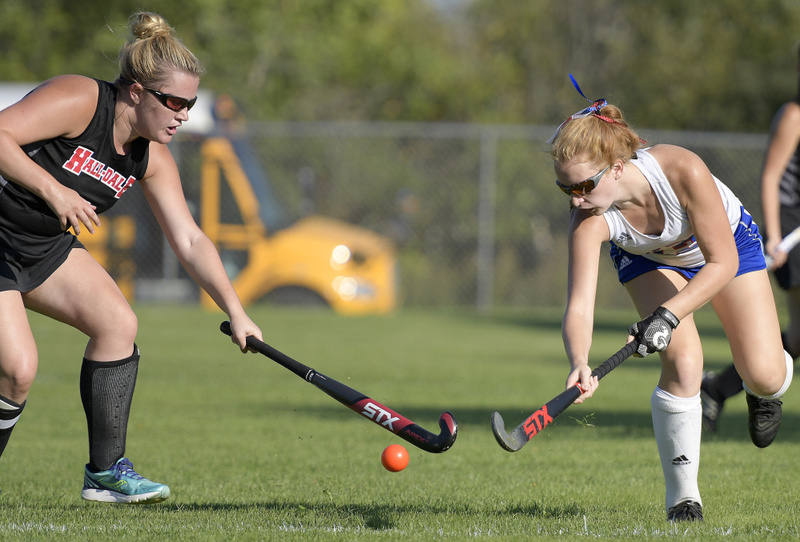 A year ago, the Oak Hill field hockey team battled its way through a tough Class C schedule and came away with its first state championship. This year, the Raiders are rebuilding with a young roster and battling for a playoff spot. Last fall, Hall-Dale won two games and missed the playoff, but the Bulldogs already have three wins this season and remain in contention. Those team met Wednesday in a Mountain Valley Conference game played at Carrie Ricker Middle School and the host Raiders came away with a 3-1 victory. The win leaves Oak Hill at 5-6 and in sixth place in the Class C South standings while Hall-Dale falls to 3-7 and clings to the eighth and final playoff spot in Class C North. The Raiders pulled away in the second half, breaking a 1-1 tie with goals from Alexis Faucher and Desirae Dumais. 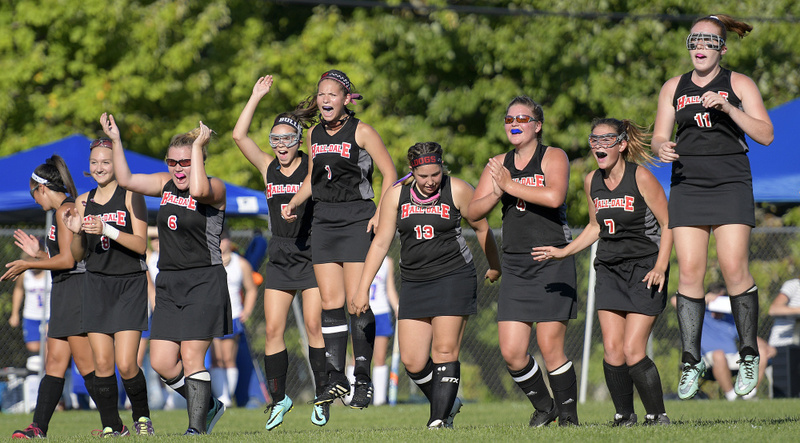 The goal was the second of the game for Dumais while Faucher added an assist as did teammates Meagan Sheehy and Kiera Young. 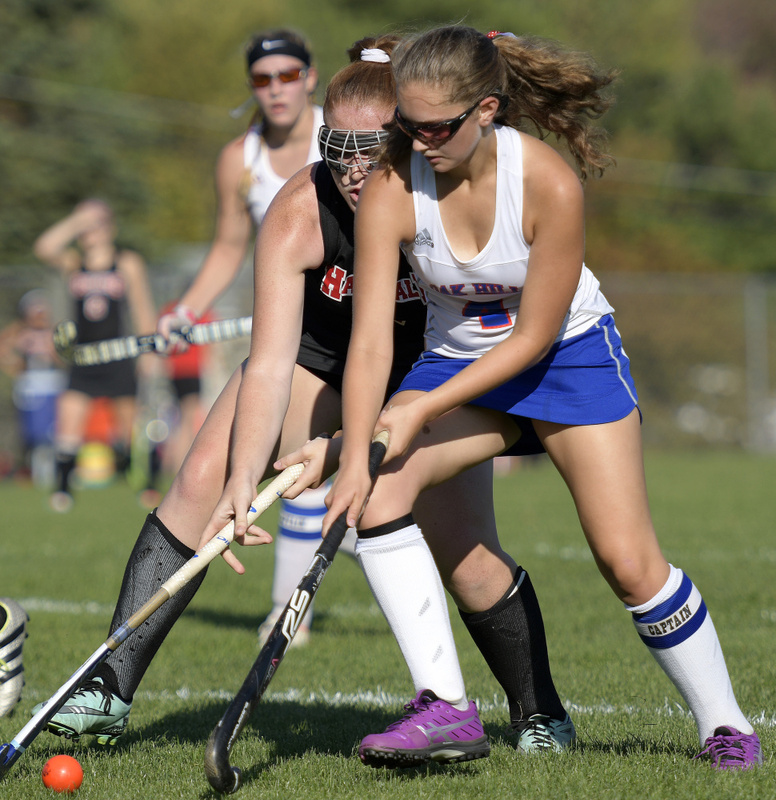 Lauren Hendrickson scored an unassisted goal for the Bulldogs. Oak Hill had the edge in play, out-shooting Hall-Dale 8-2 in the first half and 15-5 for the game. 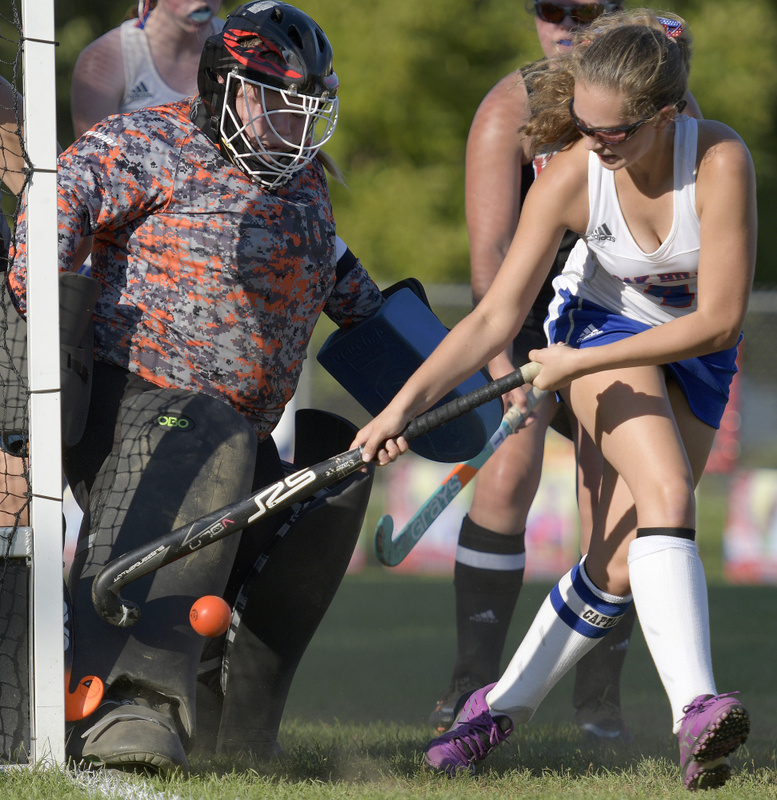 The Raiders were either stymied by Bulldog goalie Kaylee Magee (12 saves) or their inability to connect on several good scoring chances. The Raiders broke through 12 minutes into the game when Dumais took a pass Faucher and had an open shot to Magee’s left. “It was crossed beautifully and I got my stick on it,” Dumais said. 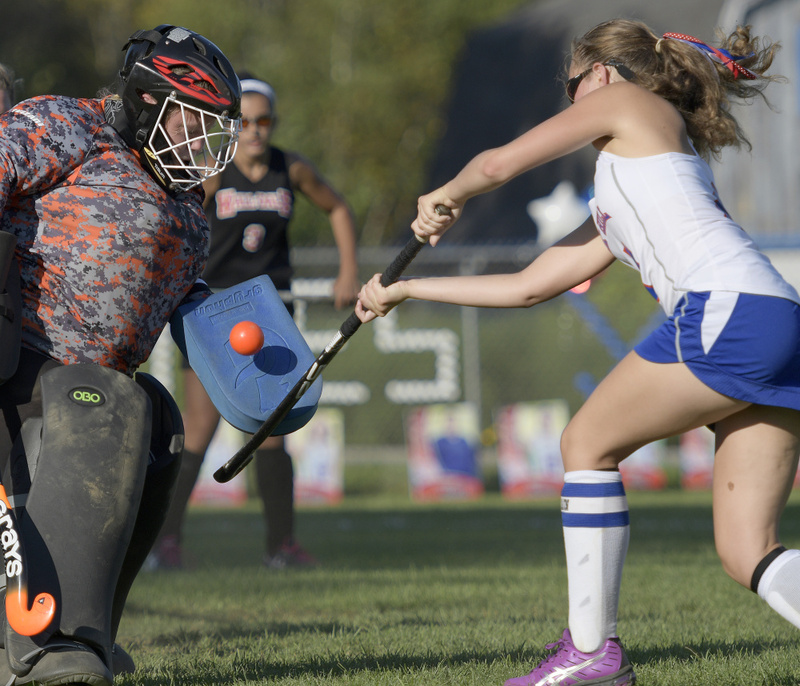 Magee kept the game close when she stopped Sheehy’s penalty stroke with 7.6 minutes left in the half. The Bulldogs put together a nice spurt in the first few minutes of the second half and were rewarded when Hendrickson dribbled down the right side and beat Mackenzie Thibeault (five saves) with a shot to the far corner of the cage. Five minutes later the Bulldogs regained the lead when Faucher found herself wide open at the left post after taking a cross from Sheehy. Dumais added an insurance goal with 15 minutes left with the assist going to Young. Corbin, who won state championships at Hall-Dale under Ellen Vickers, has embarked on a rebuilding program that reaches down to the youngest player sin the school system. And she’s pleased with her team’s progress to date.